The hydraulic tower is built with German technology; had a twin sister in the city of Stuttgart, Germany, but was destroyed in World War II as well as being unique in the world. Its structure has no point of welds, rivets only has 35 m above ground level, the base is 10 ft and the area has a diameter of 12 m.
Its storage capacity is approximately 904.77 cubic meters. His inauguration was the centenary of the independence movement (1910). 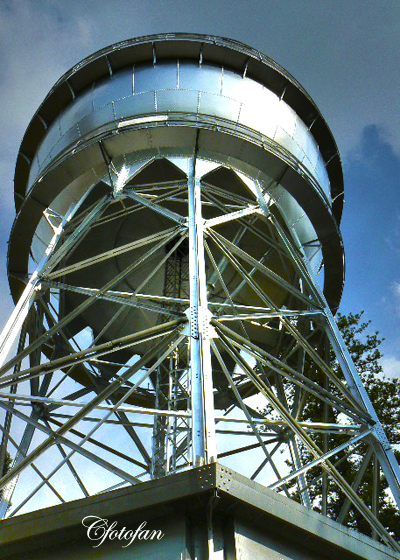 German manufacturing, built by the German Enrique Shondube, also known as the “water ball”. Currently he is the symbol of ciudad. La torre hidráulica fue fabricada con tecnología Alemana; contaba con una hermana gemela en la ciudad de Stuttgart, Alemania, pero fue destruida en la Segunda Guerra Mundial quedando así como única en el mundo. Su estructura no tiene punto de soldaduras, sólo remaches, cuenta con 35 m de altura sobre el nivel del suelo, la base mide 10 m y la esfera cuenta con un diámetro de 12 m.
Su capacidad de almacenaje es 904.77 metros cúbicos aproximadamente. Su inauguración fue con motivo del centenario del movimiento de independencia (1910). This entry was posted in captures, cultura, culture, fotografías, fotos, gallery, historia, history, Images, imágenes, photos, pictures, travel and tourism, turismo and tagged bola del agua, Catedral, Celaya, centro histórico, historic center, hydraulic tower, primera columna de la independencia, Templo de San Francisco, torre hidráulica, water ball. Bookmark the permalink.